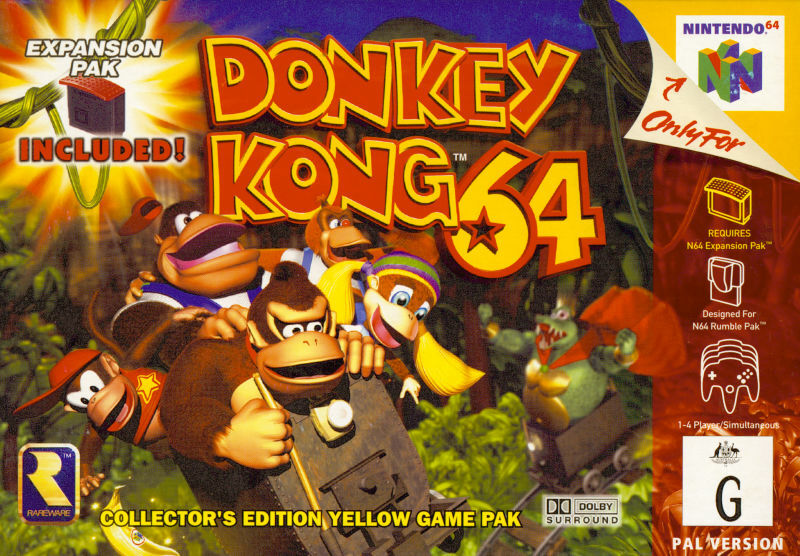 [Coming of Age] Donkey Kong 64 – I ❤ Old Games! Today, November 24th, 2017 we celebrate the release of the first fully 3D Donkey Kong game, Donkey Kong 64 that came out in 1999 for the N64. Nintendo already did a wonderful job with the previous installments on the DK series, the mini-saga of Donkey Kong Country for the SNES, that was an astonishing piece of art and showed to the world what could have been done on Nintendo 16-bit console. The big N did it again and in 1999 during the craze of the 3D conversions and after a successful 3D Mario title, Super Mario 64, they gave a three dimensional shape even to the original Mario enemy, Donkey Kong. I have played this game. I have heard reviewers criticise this game, but I really enjoyed it. I enjoyed the cartoonlike aspects of the game, the designs of the different locations, the different abilities of each character, the bosses, the original Donkey Kong game, the challenges, the multiplayer mode and collecting the different items. I especially enjoyed reading the instruction manual, which was written from the point of view of Cranky Kong and consisted of him making fun of the game. I remember the game needed the expansion pak and the special controller for the Nintendo 64, which resembled a bunch of bananas. Did you like the game? Have you experienced many Donkey Kong games? Loved this game, even though it was so different from the DKC trilogy!